Use of this Pin Code signifies acceptance of these terms and conditions, which are subject to change as noted on webkinz.com. Cannot be redeemed for cash, returned for cash or credit, or used for any other purpose. Void where prohibited or restricted by law. The Pin Code shall be deemed issued and have the value shown on its face only after activation. If applicable, taxes must be paid separately, and are not included. The full value of the Pin Code is deducted at redemption, and no incremental deductions are allowed. Except where required by law, the value of the Pin Code will not be replaced if lost, stolen, destroyed or used without the owner's permission. 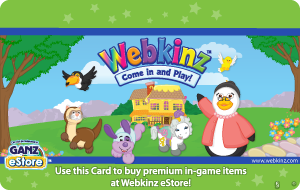 Ganz reserves the right to terminate the redeeming Webkinz World account without notice in the event that this pin code is fraudulently or otherwise unlawfully obtained or used. Ganz, its partners, affiliates, third party licensors and suppliers, and/or their successors and assigns make no warranties, express or implied, with respect to this Pin Code, products or services available from Webkinz World or Ganz eStore, including without limitation, any express or implied warranty or merchantability or fitness for a particular purpose. In the event this pin code in non-functional, to the extent permitted by law, your sole and exclusive remedy, and our sole liability, shall be the replacement of such code. Certain state and provincial laws do not allow limitations on the implied warranties or the exclusion or limitation of certain damages. If these laws apply to you, some or all of the above disclaimers, exclusions, or limitations may not apply to you, and you may also have additional rights.